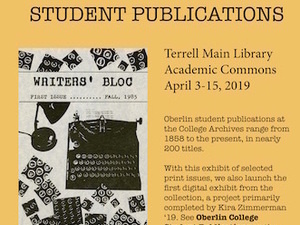 The College Archives announces an exhibit and a new digital collection on the Oberlin College Student Publications Collection, comprising nearly 200 print titles ranging from 1858 to the present. Student publications have thrived in the two decades since 2000, with 50 different titles published. The physical exhibit in the Terrell Main Library will be on view on the main level April 3-15. Access the digital collection at http://cdm15963.contentdm.oclc.org/cdm/landingpage/collection/p15963coll54 and from the Archives home page. An iPad kiosk will be stationed near the physical exhibit for browsing the digital collection. The web access project involved the first content analysis of Oberlin College student publications. In 2018, Kira Zimmerman ’19, archives student assistant, wrote descriptions, and assigned tags and genre terms for the online exhibit. Additional work was done by Archives staff, and the digital collection was published on March 26, 2019. This stage of the project involved selecting one cover for digitization to represent the entire run of each publication. Digitization of some or all of the contents of the titles may be done at a later time.